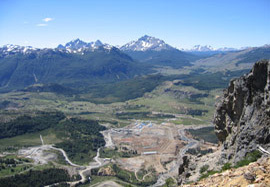 The El Toqui mine is an underground zinc mine with gold credits located in Region XI, Chile, approximately 838 miles south of Santiago and 74 miles northeast of Coyhaique. At a gold price of $1,200 per ounce; a silver price of $18.00 per ounce; a lead price of $0.91 per pound; and a zinc price of $0.95 per pound. Recovered metals are contained in concentrate and are subject to third party treatment charges and recovery losses. The Operator is disputing the obligation to pay royalty on silver and lead, and has not provided production information for silver and lead. Silver production in CY16 is from a single zinc concentrate shipment.